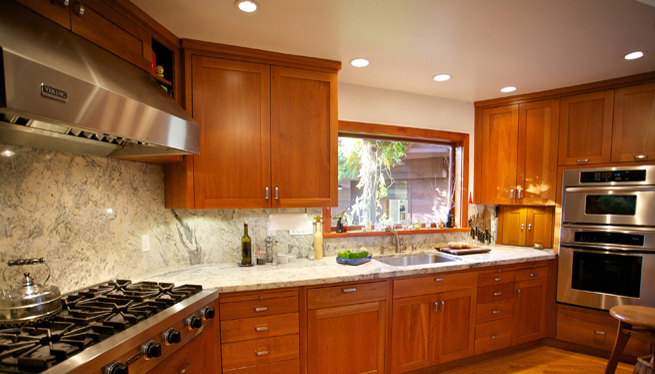 The kitchen is perhaps one of the most detailed rooms in the home to remodel. You can spend a lot of money and time on the room to completely change the appearance, or you can change only a few things to give an entirely new look. Before doing any remodeling in the kitchen, you should consider getting home renovation estimates as some companies can do multiple rooms in the home for a lower price compared to a higher rate with only one small area. If you don't want to spend a lot of time on the project, then change the paint in the room, the hardware on the cabinets and the drawers and the decorations that are on the walls. It might not seem like a lot, but it can give the kitchen an entirely new look without spending a lot of money. Painting your cabinets white with black hardware is a way to make the room seem larger. You can also change the design of the cabinets, either giving a modern look or one that is a little more on the antique side. The white will give an easy way to add backsplash on the walls in various colors and use almost any color of curtains and decorations in the room. Turn the basic kitchen into one that looks like it came from a farmhouse with pots and pans hanging on the wall, a wooden island for preparing meals and an apron-front sink that offers a little more room for washing dishes. A spacious kitchen can become one that is light and airy, even if some of the items in the room are dated. Change the colors to those that are bright and vibrant, giving an open appearance. Barstools around a table in the center of the room offer a different type of place to sit. Consider adding a large cabinet with glass doors along one wall to store dishes and items that don't usually get seen in the room. A hardwood floor with rugs that are bright in color would also make for an easy remodeling project in the kitchen.